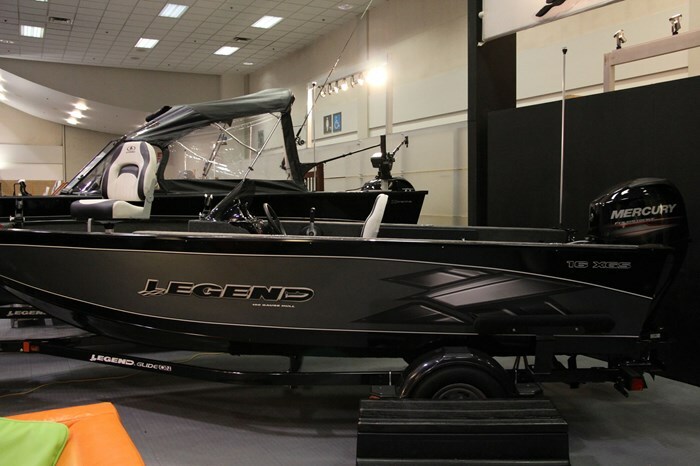 For 2015, Legend Boats of Whitefish, Ontario (near Sudbury) offers seven models of utility boats from twelve to sixteen feet in three series; seven models of side-consoles from fifteen to twenty feet in five series; ten models of full-windshield models from fifteen to twenty feet in five series; plus eighteen models of pontoon boats from seventeen to twenty-six feet in five series. If you’re counting, that’s a total of forty-two models of aluminum boats – some riveted, some welded and all packaged with Mercury® outboard motors. 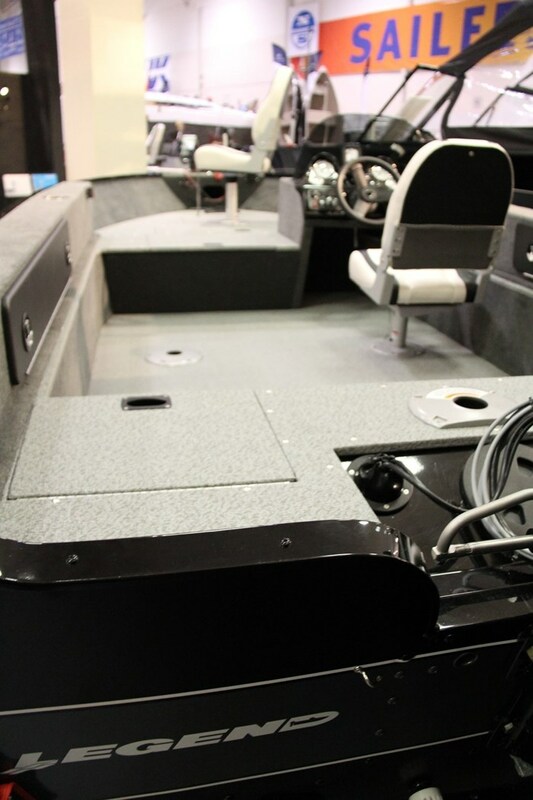 The 16 XGS is part of Legend’s seven model True Fisherman side console series. 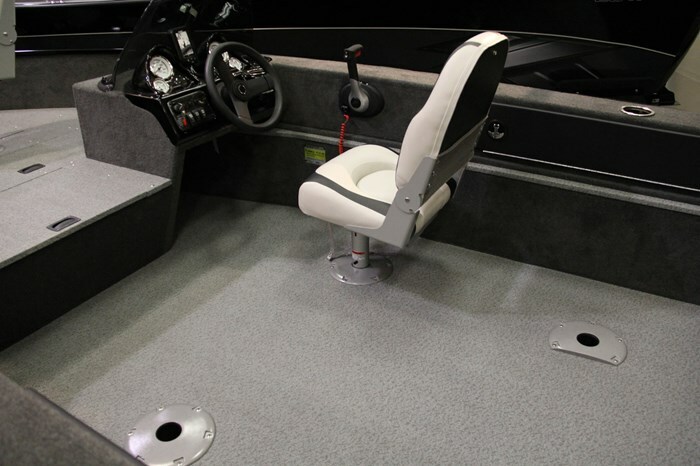 The 16 XGS is not a new model for 2015 but what it has that’s new for this year is Legend’s EZ-Clean Dura-Deck vinyl interior flooring covering all horizontal surfaces including the cockpit plus both bow and stern casting decks. 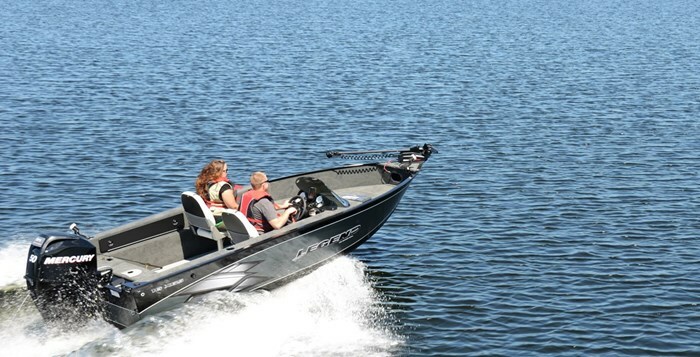 It rides on Legend’s all-welded hull constructed with .100 gauge aluminum utilizing a two-piece hull with no side seams and locked into a solid centre and bow extrusion which is over one-inch thick. Injected foam within the hull for strength and sound insulation provides the 16 XGS with level floatation properties. A high-gloss oven-cured urethane paint finishes the exterior of the hull and 3M reflective striping is applied not only for daytime graphic appeal but for added night time safety. A transferable Leakproof for Life Warranty comes with this boat. 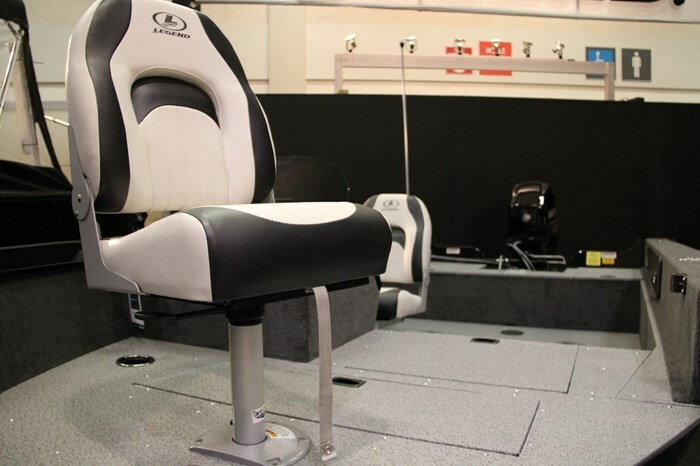 Two composite removable high-back swivel fishing chairs with rear storage netting come standard along with six floor mounting locations – four in the cockpit and one each on the bow and stern casting decks. Within this stern casting deck are two built-in storage compartments with hinged lids. Centred below is the battery compartment. Lockable storage compartments for fishing rods are found beneath both port and starboard side gunnels. Two additional large covered storage compartments are located within the bow casting platform, one immediately to the port side of the driver’s helm and the other right near the bow. Centred in the bow casting deck between the two storage compartments is a huge 30-gallon aerated livewell complete with integrated bait bucket and threaded Sure-Lock stand pipe with overflow protection. The bow trolling motor platform with some storage below comes pre-wired for a 12-volt trolling motor plus a MotorGuide W45, 48-inch wireless trolling motor complete with a MotorGuide handheld wireless remote as standard equipment. 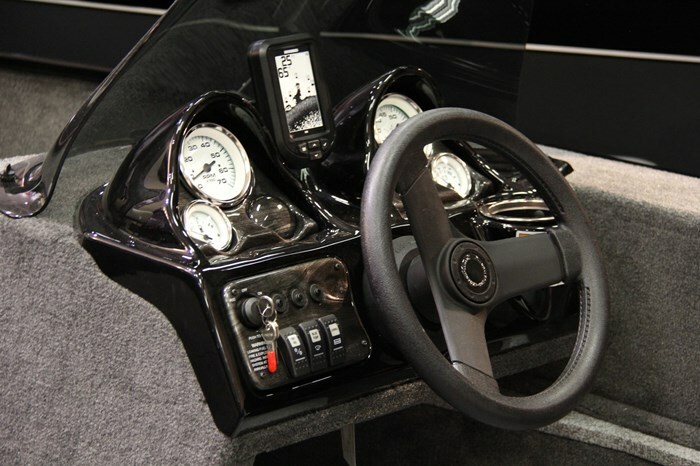 The molded driver’s starboard side console helm features a “Deluxe Full-Vu console with woodgrain dash” with integrated drink holder and chrome-bezeled back-lit instrumentation including speedometer and tachometer. 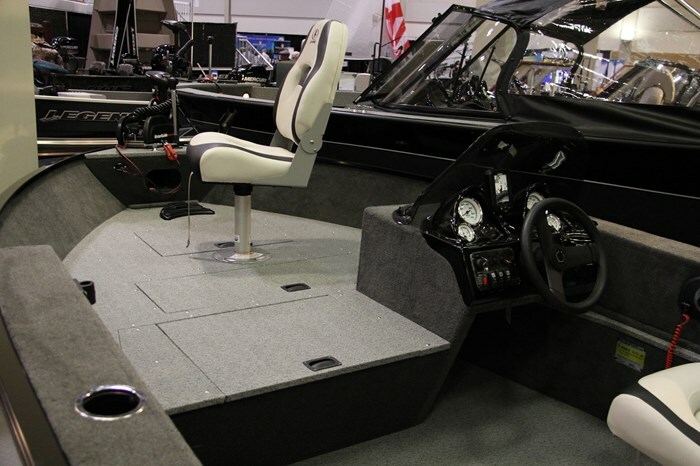 Also standard is a driver’s seat slider, a 12-volt power outlet, plus a Humminbird Piranha MAX 175 fish/depth finder. Other notable standard equipment on the 16 XGS includes two deluxe rod holders, a Custom-Matched Glide-On trailer by Shoreland’r featuring a swing-tongue, jack, dolly, and tie-downs. 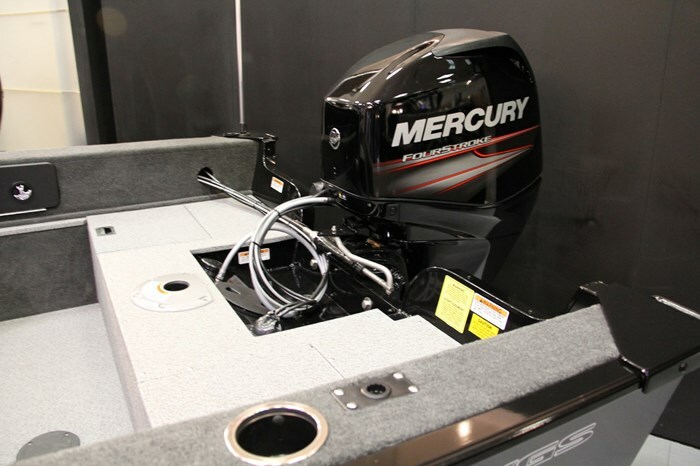 Standard power is a Mercury® 40 EL 4-stroke outboard which Legend estimates will produce a top speed of just under 30 mph. The boat is rated for up to 90 horsepower so, depending on the type of boating you wish to do, there are lots of larger Mercury® outboards from which to choose. Legend has a complete catalogue of accessories available to allow you to not only personalize your 16 XGS side console to your heart’s content, but also to completely outfit it with all your necessary safety and mooring gear. Choose from a variety of trailer accessories, several seating options, canvas covers, electric motor accessories, electronics, custom colour kits, etc.